Gear up for Robinsons Malls’ Giant Sale – the last biggest SALE of the year. Shoppers will get to enjoy up to 70% OFF on the widest selections at Robinsons Malls nationwide plus shop until midnight on October 19 in selected malls and at regular mall hours on October 20 and 21. Participating malls include Robinsons Galleria, Forum Robinsons, Robinsons Nova Market, Robinsons Place Manila, Robinsons Metro East, Robinsons Cainta, Robinsons Starmills, Robinsons Angeles, Robinsons Ilocos, Robinsons Place Pangasinan, Robinsons Place Dasmarinas, Robinsons Place Imus, Robinsons Sta. Rosa Market, Robinsons Town Mall Los Banos, Robinsons Place Lipa, Robinsons Fuente, Robinsons Place Bacolold, Robinsons Place Dumaguete, Robinsons Place Iloilo, Robinsons Place Tacloban, Robinsons Place GenSan, Robinsons Place Palawan, Robinsons Supermarket Pulilan and Robinsons Cabanatuan. Now be ready with your Christmas shopping list and rush to Robinsons Malls! 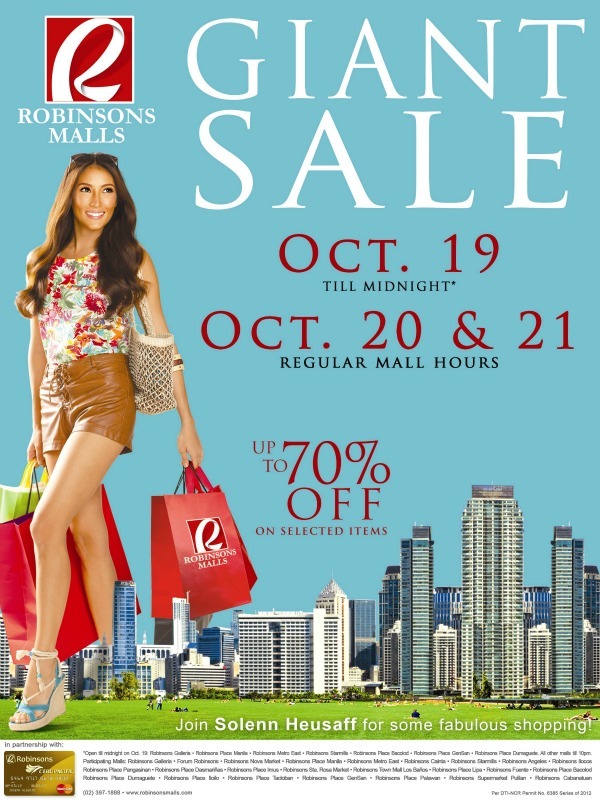 For more information, like Robinsons Malls on Facebook and follow @RobinsonsMalls on Twitter.